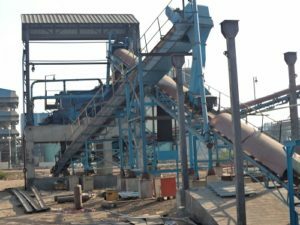 Every sector especially the core sectors need efficient bulk material handling and processing systems to remain competitive. Effectiveness of bulk material handling systems for some industries has strategic implications. AEGIS with 3 decades of experience has gained expertise in bulk material handling. This rich experience is incorporated with the technical knowhow in each and every project that AEGIS takes up. AEGIS believes in delivering value. It is ensured that the systems supplied by AEGIS come with high value addition in terms of highest quality and at an affordable cost. Optimal selection of components for manufacturing of the various equipment involved in the entire System is done with due care. The equipments are produced with best manufacturing practices. Project management and the precision of production monitoring and quality control are assured by the company’s own qualified experts, who also ensure that the time schedule is maintained. AEGIS’s success is a result of combination of special know-how in bulk handling technology, the wealth of experience accumulated in industrial plant engineering and the use of carefully chosen third-party companies which guarantees AEGIS, its exceptional productive capacity. Qualified counseling in all matters of bulk material handling for wide variety of materials. The drawing up of technically sophisticated concepts, closely related to practical criteria, for the solving of problems specific to the customer. Presentation of complete quotations with guaranteed prices and time schedule. Complete order execution in one hand, from the design and construction of the handling facilities to their assembly and the successful commissioning of the system.